Based in Colorado, Smart Cookie Dog Treats is a company that creates customizable treats for dogs. On December 15th, Smart Cookie will be donating 15% of its sales to The Grey Muzzle Organization. In advance of the occasion, we have taken the opportunity to ask Smart Cookie's co-founder Bri Bradley more about the inspiration behind the company and the unique treats they offer. 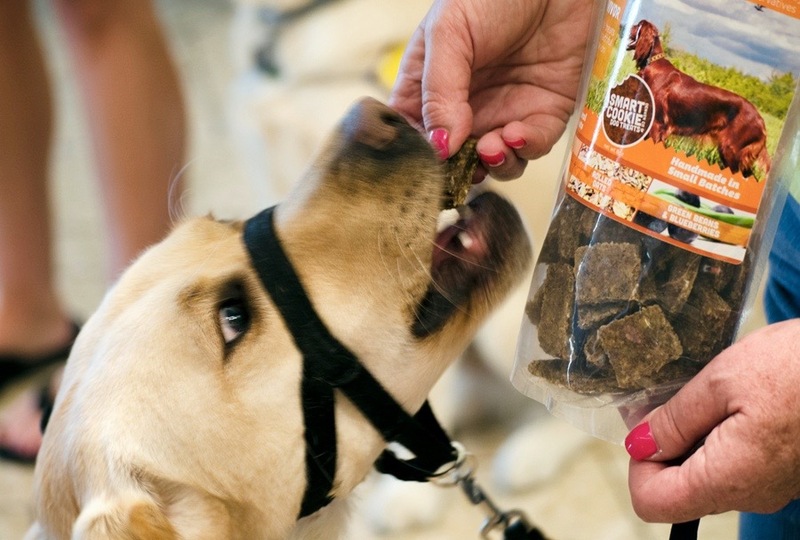 How did Smart Cookie Dog Treats get its start? In February 2012, my husband, Scott, and I started what became Smart Cookie after our beloved dog, Ruger, was diagnosed with lymphoma and I was diagnosed with breast cancer. Only able to eat the healthiest and best food and treats out there, we started making treats for Ruger with only the best ingredients available. Not only did this help us keep our minds off of things at night after work, but we started to pass them out to friends and family and they were a hit! Having always wanted to start a business our own, suddenly Smart Cookie Dog Treats was born and is now a family owned and operated business headquartered in Denver, CO.
What makes Smart Cookie Treats special? Besides offering the most delicious treats that are even edible by humans, we offer the only customizable dog treats on the market. Our customers get to select the three key ingredients they want in their dog's treats: a protein (chicken, beef or salmon), a carbohydrate (quinoa, oats, barley, or brown rice), and a fruit and vegetable (carrots and cranberries, or green beans and blueberries) to best fit their dog’s needs, dietary restrictions, lifestyle, or preference. Smart Cookie also has Colorado's first food "truck" for dogs! The two Smart Cookie carts peddle around to different dog parks, farmer's markets and events around Colorado offering up yummy custom dog treats, rabbit jerky and treats made with spent grain from local Colorado breweries. Why might people with senior dogs want to try your treats? As dogs age, their dietary needs change. Senior dogs in particular can have health concerns, sensitive stomachs, or achy joints, so treats to suit those needs may be hard to find. With Smart Cookie, you can actually build your own custom treats specifically formulated with ingredients to support your senior dogs’ lifestyle and needs. A lot of the senior dogs’ favorite is oats and salmon, particularly great for the joints! Sam, Smart Cookie's "Chief Tasting Officer"
I think one of our favorite customer stories is from a gentleman who is blind and uses our treats for his service dog. He once told us that she loves our treats so much that she would probably dance for them, even at the worst of times, like crossing a street. He then quickly stated, “and that wouldn’t be good for either one of us, but that certainly would look cute!” The relationship that those two have is what keeps us motivated to make the best treats possible. What would you say to someone concerned about their dog's allergies or sensitive stomach? Allergies and sensitive tummy issues are the most common concerns we hear from dog owners, and we are happy to offer several options! Rabbit Jerky is one of our most popular treats, and for a good reason: Rabbit is a hypoallergenic protein that is not only allergy-friendly, but is also lower in fat and cholesterol than other proteins on the market which also makes it easily digestible. Sensitive stomachs also tend to do well with our treats made with oats or chicken. Oats are naturally soothing and anti-inflammatory so they can calm upset tummies (and achy joints!). Chicken is a lean protein so it shouldn’t cause any digestive issues. What is your most popular treat? We have two. One is our Rabbit Jerky—we jokingly call this treat “doggie crack” because dogs love it so much—even the picky ones! Our other most popular treat is The Survivor. Aptly named for Ruger, this treat is made with chicken, oats, green beans & blueberries, low in fat, anti-inflammatory, and lots of antioxidants to ward off those free-radical ninjas. You can find out more about Smart Cookie and order its treats at: www.smartcookietreats.com.